Dr. Ali Sepehr can enhance the appearance of the lips with lip lift surgery or non-surgical injectables depending upon the patient’s needs, ultimately providing a more shapely aesthetic. Irvine, CA — As people age, the lips become susceptible to volume loss. The lips may gradually appear thin or begin to lose their definition. In response to this common cosmetic concern, Irvine facial plastic surgeon Ali Sepehr, MD now offers his patients several lip enhancement options to enhance the appearance of their lips. “Lip enhancement procedures are designed to rejuvenate, contour, or augment the lips for a beautiful and youthful aesthetic,” says Dr. Sepehr. During the consultation process, he carefully listens to each patient’s unique goals and examines the characteristics of their lips before reviewing the patient’s best enhancement options. Depending upon the extent of volume loss and patient expectations, Dr. Sepehr may recommend a surgical or non-surgical technique. For patients who prefer a non-surgical method of lip enhancement, dermal filler injectables such as Restylane®, JUVÉDERM®, or JUVÉDERM VOLBELLA® can effectively plump the lips for a fuller appearance. Each cosmetic injectable has unique properties, and Dr. Sepehr can develop a customized treatment plan suited for the patient’s needs. Composed of hyaluronic acid, these dermal fillers are able to boost the natural contours of the lip, adding volume and increasing definition. As an added benefit of non-surgical lip enhancement, patients may notice fine lines diminish in the area around the lips. According to Dr. Sepehr, the results of these non-surgical lip enhancement methods can last up to one year or more. He adds that touch-up treatments can be performed to easily maintain the results. 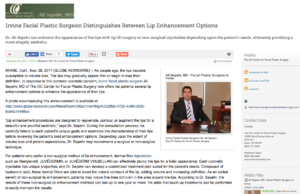 Dr. Sepehr highlights that long-lasting results are one major advantage of a surgical lip enhancement procedure such as a lip lift. With this type of lip augmentation, the facial plastic surgeon can accentuate the “cupid’s bow” shape of the top lip, widen the colored area of the lips, add additional volume, and shorten a long upper lip creating a more youthful aesthetic. Dr. Sepehr also notes the procedure can be performed in a manner that results in minimal scarring for an exceptionally natural appearance. Regardless of whether surgical or non-surgical lip enhancement is performed, Dr. Sepehr says his patients typically report an overall boost in their self-confidence from their beautiful, more shapely lip appearance. Dr. Ali Sepehr earned his medical degree at the University of California, Irvine and completed additional medical training at the University of Toronto School of Medicine. He is fellowship-trained and certified by the American Board of Facial Plastic Surgery. Dr. Sepehr is the recipient of numerous awards and serves as a Diplomate of the National Board of Medical Examiners. In addition, he dedicates much of his time to outreach programs, including the Salvation Army Mobile Clinic, the UCLA School of Medicine Mobile Clinic, and the Lennox High School Health Fair. Dr. Sepehr is available for interview upon request.